Dr. Jennifer Gerber is the new owner of Green Lawn Animal Clinic in Greenville, taking over from Dr. Robert Burns, who is retiring after 44 years. GREENVILLE — Local canines and felines will now see a new friendly face when being treated. 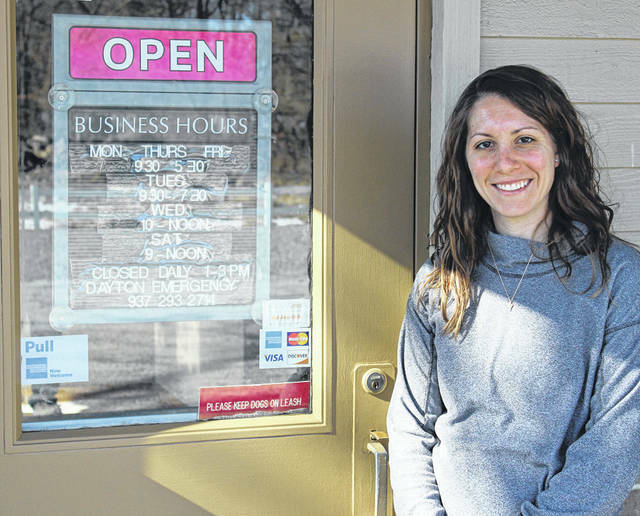 Dr. Jennifer Gerber, DVM, is the new owner of Green Lawn Animal Clinic in Greenville. She takes over the clinic formerly run by Dr. Robert Burns, DVM, who is retiring after 44 years in practice. “He will still be here, helping me, behind the scenes,” she said. Gerber is a 2005 graduate of Mississinawa Valley High School and received her post-secondary education at Wright State University and The Ohio State University. She lives north of Greenville with her husband, Sean, and two young children, Emma, 3, and Wyatt, 1. Prior to taking over at Green Lawn, she worked at Community Veterinary Clinic locations in Sidney, Piqua and Troy. Gerber said moving her veterinary practice to Greenville, close to home, is a great opportunity. She wished to express her thanks to her husband, family, Dr. Burns and his wife, the clinic staff, attorney Travis Fliehman and Fry & Co. CPA for their assistance in helping her being this endeavor. “I’m happy to be here, excited to be here and grateful for the opportunity. Everyone’s been very welcoming,” she said. This entry was tagged business, Cat, Cats, dog, Dogs, Green Lawn Animal Clinic, Greenville, Jennifer Gerber, Mississinawa Valley, Pets, Robert Burns, Veterinarian. Bookmark the permalink.